Nowadays many people use a smartphone or tablet device to access the internet. Unfortunately in the past websites were designed for computer monitors, so when they are viewed on a narrow screen they are difficult to read. Also mobile devices usually use touch screens - so links and menu buttons are too small to select. Previously you had to zoom in to an area to select something and then zoom out again. Whilst you are zoomed in the rest of the page is out of view. The answer is to have responsive web pages that display the most appropriate layout and content for the screen width that is being used (multiple versions of each page). Google are now going to rank websites that are suitable for mobiles and when you search on a mobile the results will reflect their suitability to display pages (i.e. mobile-friendly). I am now designing websites to make them mobile-friendly and I am proud to show you (right) the result of an automated test of this website, by Google, for its mobile suitability. Rated as "awesome! This shows our home page as viewed on a smartphone (before a new menu was added). If you are viewing at present on a large screen you will only see the pages that can be displayed in full width (the default size of the page). To see the mobile pages you can use a mobile device - or you can simulate the result if you have a Firefox browser by pressing Ctrl/Shift/"m" and reducing the screen display by dragging the right hand border to the left until the other page(s) appear. It is not always possible to display lists, charts etc. on a smartphone when it is held in the portrait position as they are too wide. I have used a facility to display a different (wider) screen when the phone is turned to the landscape postiion. 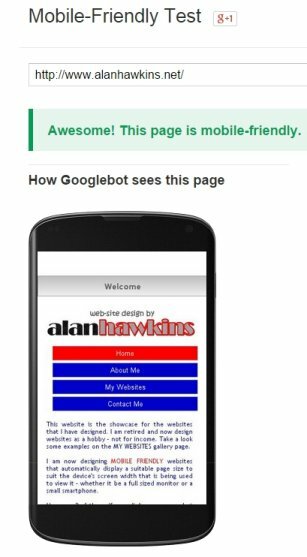 I am now designing websites to make them mobile-friendly and I am proud to announce the result of an automated test of this website, by Google, for its mobile suitability. It was rated as "awesome!